As with all IKEA products, this FLYTTA is (relatively) simple to take apart, move, and reassemble. We didn’t bring any power tools with us for the pick-up, so two of us spent about 30 minutes taking the cart apart. It was slow going because there were a lot of machine screws holding the cart together. It wasn’t difficult, just awkward doing it with a hex key. On the porch. In the rain. The cart was in pretty good condition. The wheels turned smoothly. There weren’t any deep scratches on the shelves, just light ones typical of any used stainless steel surface. The one thing we were a little surprised to see was some surface rust on the shelves, the towel handles, and the rails. These were more cosmetic than anything else. We were able to quickly remove them with a light sanding with 300-grit grade paper (before, after). With less than 1″ between the screws and the shelves made made it difficult for a power driver to fit. We took a FirstLook at a tool called the Swift Driver last month. We realized this was the perfect opportunity to give it a FirstUse test. The Swift Driverhad no problem fitting into the allotted space and made reassembling the FLYTTA a snap. The ratcheting action meant that there was no need to completely rotate the handle as with a typical driver or with a hex key, a feature which is especially appreciated when working in tight places. When holding the collar to engage the dual-drive mechanism, the rate of rotation was increased by a factor of two. This tool from True Value’s Master Mechanics series made the assembly job quick and easy, something not always truefor IKEA projects. We found it best to have two people for assembling this cart. While it was possible for one person to attach the legs and install the rails, it was not easy to mount the second shelf alone. 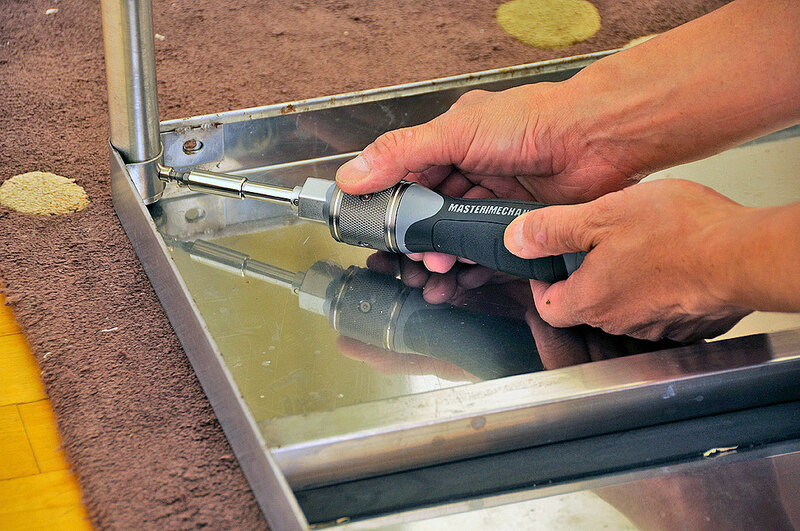 To mount that shelf, one needs a way to support the shelf at the right height while tightening the machine screws into the legs. One might be able to do it by balancing the shelf on a knee, but that would only work for the middle shelf; it wouldn’t work for the bottom one. Hmmm, a thought just occurred to us…one person MAY be able to do it if the cart is placed on its edge, not its top. We may have one of the interns try it just for fun. Now that we have the IKEA FLYTTA cart assembled, we realized that is actually a little too large for the RainyDayKitchen. 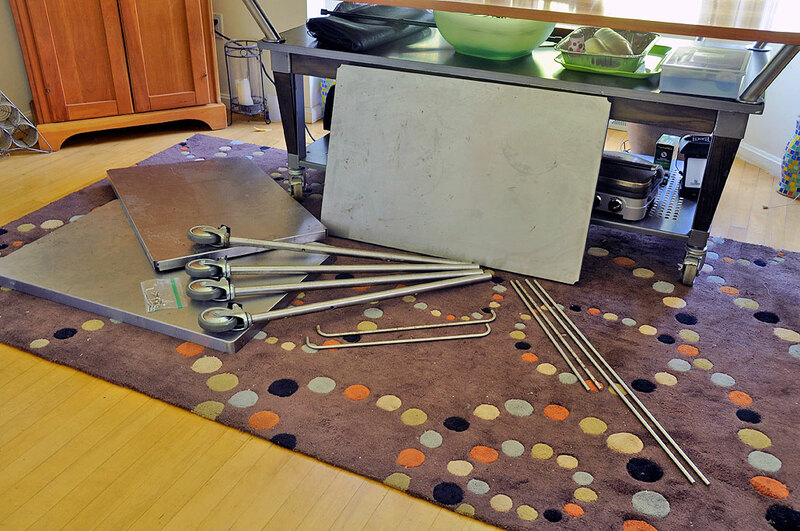 However, since it has been cleaned and is ready for service, we are sure we’ll find a home for it …perhaps in our workshop or in someone else’s kitchen (Craigslist, baby). 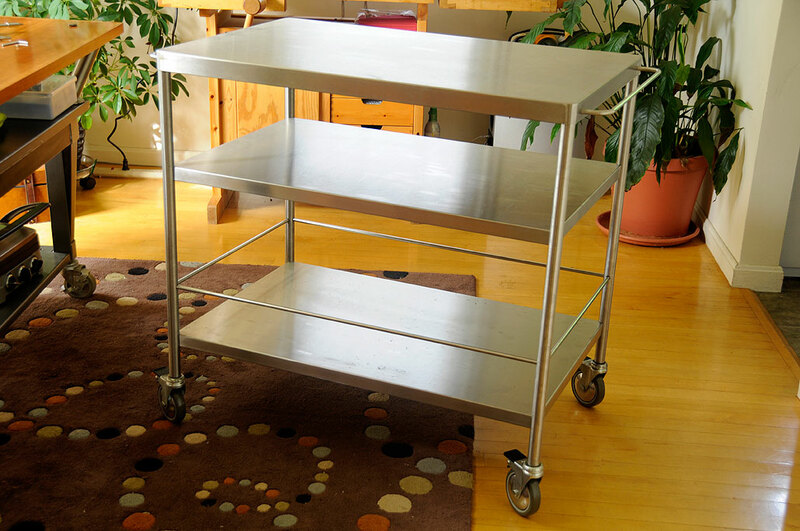 Everyone has a use for a sturdy stainless steel cart.